Do you recognize this constellation? 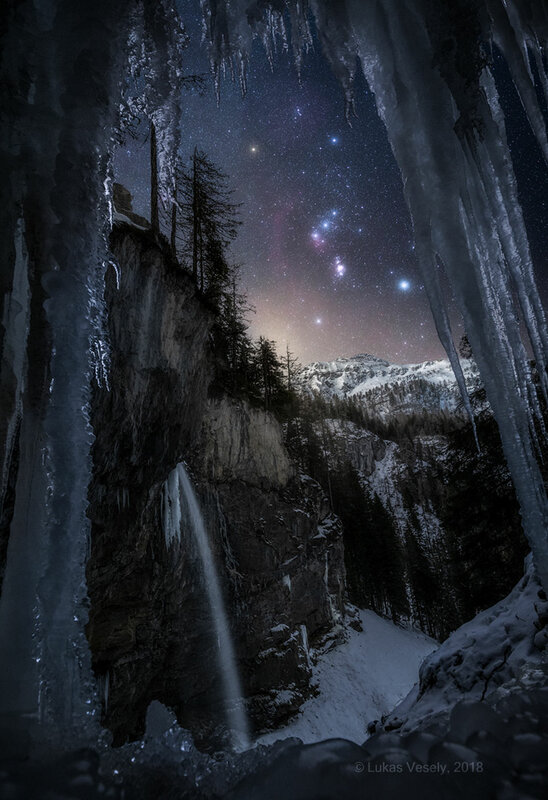 Through the icicles and past the mountains is Orion, one of the most identifiable star groupings on the sky and an icon familiar to humanity for over 30,000 years. Orion has looked pretty much the same during the past 50,000 years and should continue to look the same for many thousands of years into the future. Orion is quite prominent in the sky this time of year, a recurring sign of (modern) winter in Earth’s northern hemisphere and summer in the south. Pictured, Orion was captured recently above the Austrian Alps in a composite of seven images taken by the same camera in the same location during the same night. Below and slightly to the right of Orion’s three-star belt is the Orion Nebula, while the four bright stars surrounding the belt are, clockwise from the upper left, Betelgeuse, Bellatrix, Rigel, and Saiph. Posted on Wednesday, 23 January 2019 by VGC	This entry was posted in ifttt-photograph and tagged IFTTT, NASA. Bookmark the permalink.